d i v e r s i t y w o m a n . c o m S u m m e r 2 0 1 7 D I V E R S I T Y W O M A N 35 on For Peete's Sake than they have anywhere else in life," she says. "Before RJ, my son, there really has never been any other character on TV [with autism]. You can see that he is a real guy! e only other show that did that and did it very well was Parenthood on NBC. It had a young boy with Asperger's. Before that, the only person or character we had to point to was [Dustin Hoffman in] Rain Man, and that's pretty pathetic considering how prevalent autism is." W hile some actresses in their early 50s are pushing against the glass ceiling of age and dealing with that frustration, Holly Peete seems content. Her life is not defined by her acting roles. She still acts—she has a recurring role on Chicago Fire, and she recently signed a deal to star in a mystery series on the Hallmark Channel. Peete has a clothing line with the online retailer Evine and writes children's books. With her daughter, Ryan (RJ's twin), Peete wrote My Brother, Charlie, aimed at educators and fami- lies of young school-age kids with autism. Last year, mother and daughter released a second book, this one for a young teen audience, called Same But Different. When asked to reveal her bucket list, Holly doesn't rhapso- dize about juicy acting roles or skydiving or traveling around the world. Instead, she wants to further the understanding of the challenges—and the individuality—of children with autism. "I feel pretty content careerwise," she says. "I feel like I never really set out to be a successful television actress. I've done that, so I feel pretty good about it. I think my bucket list is really more along the lines of my autism advocacy. Being able to get some of this legislation put through, to spread more autism awareness, to have families impacted by autism not be discriminated against and have more awareness in their com- munities. Just to have more tolerance of people with special needs. I still see a lot of ignorance and stigma about what au- tism is. It really bothers me. "erefore, I want to make sure that everybody understands what autism is and learns how not to be so judgmental, so the stigma of autism will finally go away." DW this man being shot in the arm, he and the police might have escorted the young man back to his group home." 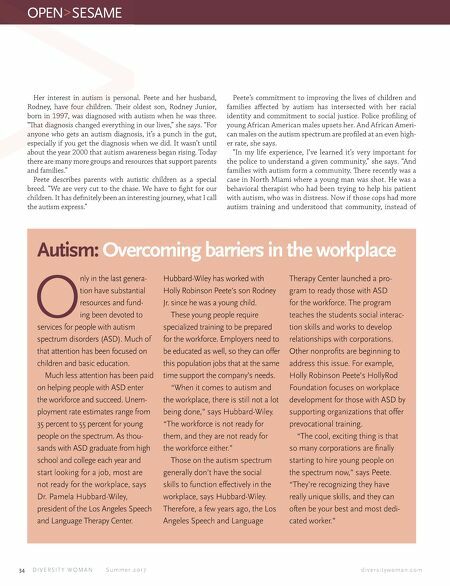 To that end, Peete is working on getting legislation passed in California for mandatory officer training in autism. She is also working to get the California legislature to pass a bill requiring that driver licenses and ID cards display when people have an autism spectrum diagnosis. She is using another platform to further her cause. Since 2016, the Peete family has been the stars of a reality show on OWN, For Peete's Sake. Season two began in February. e show follows Peete's family members as they navigate every- day life. One focuses on Rodney counseling his teenage son, Robinson, about marijuana use, another on Holly's 80-year- old mother, Dolores, deciding to begin dating. One of the on- going focal points of the show is Rodney Junior's struggles with autism—as well as his successes. 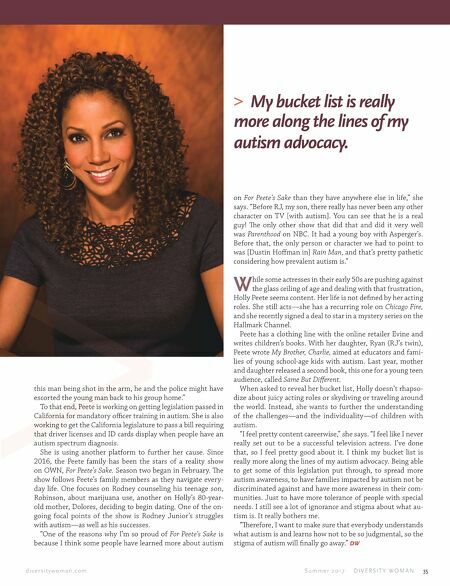 "One of the reasons why I'm so proud of For Peete's Sake is because I think some people have learned more about autism > My bucket list is really more along the lines of my autism advocacy.